The operational efficiency of organizations is often plagued by variance in performance. Organizations typically look to materials, machinery, and work methods to limit the variance. If that fails, they form teams to tweak and re-tweak their processes. While process refinement certainly can help, more often than not organizations overlook reducing variance in human performance. All processes, work methods, and procedures rely on the behavior of people to implement or support desired outcomes. Assessing variance in human performance is critical to making and sustaining gains in operational efficiency. ADI identifies and then helps organizations reduce that variance in human performance. We not only narrow the spread in performance by promoting consistent performance in individuals, we elevate the overall performance level by tapping into the discretionary effort of their workforce. 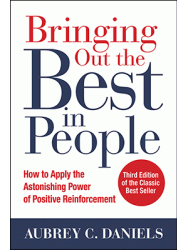 Knowing that the rate of performance improvement is directly related to the amount of positive reinforcement for that improvement, ADI helps leaders consistently recognize and reinforce incremental improvements in performance. When you earn the discretionary effort of the men and women in your organization, you will reduce the variance in human performance and elevate your organization’s overall performance level.